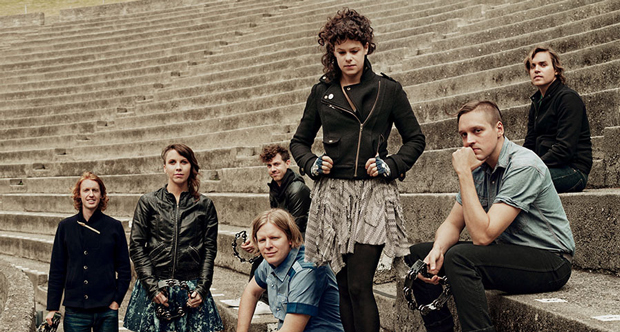 Arcade Fire is a rock band considered worldwide as the royalty of indie rock. The group was formed in Montreal, Quebec and includes Win Butler (vocals, guitar, and piano), Régine Chassagne (vocals, accordion, keyboards, and drums), Richard Reed Parry (bass, guitar), William Butler (keyboards, guitar), Tim Kingsbury (bass), and Jeremy Gara (drums). The band came in to existence in the summer of 2003 when Win saw Regine singing jazz at a Montreal art exhibit. Win was quite taken with Chassagne’s performance and soon the two collaborated into a song writing partnership. The two became equally besotted with each other as with the promise of future success and shortly after their marriage, the duo expanded into a band by recruiting Parry on organ, Kingsbury on bass, and Win Butler’s younger brother, William, on synthesizer and percussion. The band began recording immediately and the results came out on September 14, 2004 in the form of a full-length album entitled “Funeral” released in the US. The album was received with overwhelming appraise and the songs instantly rose to take the top five positions of both Billboard’s Top Heatseekers and Top Independent Album. Funeral went Gold in both Canada and the U.K. and by November 2005 it sold over 500,000 copies in US. This was a huge success for the band, much more than their anticipation. The band had taken off on the journey to stardom, performing concerts everywhere. The band also set a fashion statement with their trademark of formal attire during live concerts and gave a new dimension to rock music with their the use of various orchestral instruments. The album won a Grammy nomination in Best Alternative Rock Album category and the single “Cold Wind” was nominated in Best Song Written in 2006. Their fame spread rapidly and EMI offered them a short term contract in May 2005. The group took up some more members, Sarah Neufeld as violinist, Owen Pallet, Pietro Amato, and Marika Anthony-Shaw to serve as additional players for their live concerts. The band redoubled their efforts in the compilation of their next album, ‘Neon Bible’ which was extremely well-received by the public, gaining the second spot on Billboard’s Hot 200 within the first week of its release. Moreover, it was named Album of the Year by several music magazines including Billboard and Rolling Stone. After that, there was no turning back for Arcade Fire, they presented the public with their third album scored ‘The Suburbs’ in 2010, which racked up even more success and praise for the band, taking No.1 on Hot 200. Moreover, they were awarded with a Grammy for winning Album of the Year, nominated for Best Alternative Album and the single ‘Ready to Start’ was nominated for Best Rock Performance. In 2012, the band recorded a track for “The Hunger Games” called “Abraham’s Daughter” which brought them immense praise and approval from critics as well as the public. Their recent album ‘Reflektor’ released in October 2013 also met with similar success and praise. The band continues to delight their audience with their soulful lyrics and the harmonious blend of orchestral instruments, selling houseful on shows all over the world.